Today I begin with my frustration. Let me begin by saying I am and always have been an optimist but since 2009 of May this wonderful characteristic of mine has declined greatly and unfortunately it still declines daily. I never mentioned this on my blog because I didn’t think it needed to be talked about or was relevant but since this is my blog about my writing and artistic struggles I think it does need to be mentioned. I need you to know that I am writing from my bed. I am doing this because I have a major spinal disorder that prevents me from sitting up for long. Not only does it prevent me from sitting up but it also prevents me from running, walking, swimming, driving, and basically anything under the sun with ease. It hurts to put it mildly. I have been writing and drawing from my bed since 2009 of May because that is when my inherited disorder showed itself. I think its important to tell you this because it is the number one reason I have been struggling to finish my novel. Although the ideas are coming fast and furious and I can’t seem to get them down as good as I used to. When I write, I tend to pace and walk then sit to write then get up and do the same thing all over again. It’s a very physical process for me. 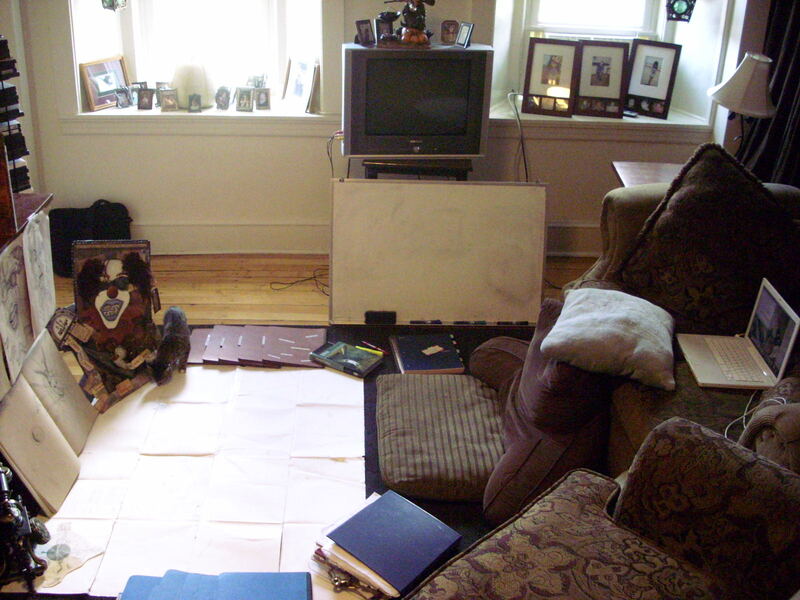 I have even gone so far as to lay on my living room for and have my friend help me set up all of my artwork and inspiration materials around me. I have attached a photo below. I want you to know I am by no means complaining. I am just giving you a glimpse into my daily life because that is what blogging is all about. Please know that I will never stop writing until my hands don’t work anymore and even then, I will probably talk – type. I love writing and all that is involved but also please know that I am struggling to do it. Thank you so much to all of my readers who have purchased my work in the past. I hope my new work lives up to your expectations.